Geneva, 7 October 2014 – Madagascar’s President, Mr Hery Rajaonarimampianina, and the CITES Secretary-General, Mr John E. Scanlon, met on 25 September in New York to follow up on the implementation of urgent actions to halt the surge in international illegal timber trade from Madagascar. The meeting was a follow up to previous talks held in Brussels last April and took place at UN headquarters in the margins of the sixty-ninth session of the United Nations General Assembly. Since April’s meeting, the government of Madagascar has requested the International Consortium on Combatting Wildlife Crime (ICCWC) for the rapid deployment of a Wildlife Incident Support Team (WIST), that will be led by INTERPOL, to guide and facilitate appropriate follow-up law enforcement actions. Relevant national authorities in Madagascar are finalizing a plan to jointly combat the illegal logging and coordinate enforcement responses to stem the flow of illegal harvested timber going out the country. The President and the Secretary-General recognized the importance of implementing the plan, appreciating the current efforts by Madagascar and recognizing the challenges it is facing to control its 5000 km long coastline. Both called for international support and cooperation to assist States in detecting illegal timber exports, trans-shipments and imports. Addressing the annual high-level debate in New York, Mr Rajaonarimampianina referred for the first time in the history of the Assembly to illegal trafficking in CITES-listed species and appealed to the international community to support Madagascar in its policy of zero tolerance with respect to all kind of trafficking involving natural resources and wildlife. “5% of the world’s biodiversity is located in Madagascar. As a result, our responsibility is to preserve this wealth and to ensure it is better managed for our future generations. As soon as I took office in January, I declared war on traffickers of rosewood, as well as on others who devote themselves to illegal trade in protected species,” he added. 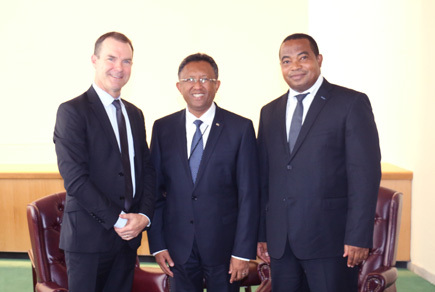 Welcoming the progress announced by Madagascar, the CITES Secretary-General offered legal and scientific support to Madagascar, including the possibility of future assistance under the ITTO-CITES programme. “The President has drawn global attention to the massive scale of the illegal trade in rosewood and the threat it poses to Madagascar's environment and economy. This theft of its natural resources needs to stop and a global collective effort is required to assist Madagascar in its efforts. It is imperative that all concerned States – be they source, transit or destination States – remain vigilant in ensuring the legality of all CITES-listed timber shipments coming from Madagascar,” said Mr Scanlon. Stocks of rosewood, palisander and ebony illegally harvested in Madagascar still going out of the country at unprecedented levels using many different routes. Major seizures continue to be reported by different countries, mainly in Africa and Asia. For instance, more than 4,000 tonnes of rosewood suspected to have been illegally exported from Madagascar were seized by authorities in various transit and destination countries between November 2013 and April 2014. Information on populations of all Dalbergia species in Madagascar is scarce. 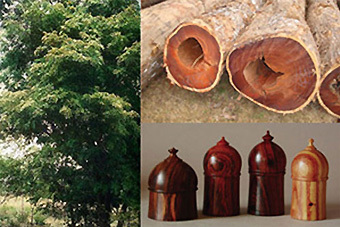 There is no consolidated information on volumes of individual species of rosewood harvested and traded, or comprehensive inventory data for any species. Official figures are not yet available but some unofficial reports estimate that recent seizures in Madagascar and abroad now exceed 50,000 logs and worth some USD 130 million at current prices, or several times that once the logs are processed into wood products like veneers. At its 16th meeting (CoP16, Bangkok, 2013), the Conference of the Parties to CITES agreed to the inclusion in Appendix II of the Malagasy populations of the genera Dalbergia and Diospyros, with an annotation restricting the listing to "logs, sawn wood and veneer sheets". At the same meeting, Parties also adopted Decision 16.152 on Malagasy ebonies (Diospyros spp.) and Malagasy rosewoods (Dalbergia spp.) and a related Action Plan. The rapid implementation of the CITES Action Plan that was adopted by CITES in March 2013, will be critical for the long-term conservation and sustainable use of these precious timbers. On 13 August 2013, the CITES Authorities of Madagascar requested the Secretariat to publish a zero quota for exports of timber of Malagasy ebonies rosewoods and palisanders, for a period of six months until 13 February 2014. Madagascar subsequently extended this export moratorium to 10 August 2015 According to the CITES Action Plan for these species, the embargo will be maintained until the Standing Committee has approved the results of a stockpile audit and use plan to determine what component of the stockpile has been legally accumulated and can be legally exported. The CITES Secretariat is reaching out to Member States, partners and potential donors to assist Madagascar in the protection of its natural heritage through the full implementation of CITES measures, including the Action Plan. ICCWC partners are exchanging information and cooperating to assist countries concerned in combating these forest crimes. It is understood that large volumes of rosewood logs have disappeared from depots in northeast Madagascar in recent months. One of the alleged modalities used by the traffickers is to smuggle the logs by small boats to larger ships waiting offshore. Operation COBRA II was organized by the Lusaka Agreement Task Force (LATF), China, South Africa, the United States of America, the Association of South East Asia Nations Wildlife Enforcement Network (ASEAN-WEN) and the South Asia Wildlife Enforcement Network (SAWEN), and was coordinated by International Coordination Teams located in Nairobi and Bangkok. The operation focused on key species that are subject to illegal trade, and resulted in a large number of arrests and the seizure of specimens from many species, including cheetah, elephant, rhinoceros, pangolin, leopard, rosewood, snake, tiger and turtle, among others. In 2007, the World Heritage Committee of UNESCO inscribed the Rainforests of the Atsinanana on the World Heritage List. Illegal harvesting of specimens of Dalbergia spp. and Diospyros spp is taking place in two of the six national parks in this area. The World Heritage Committee has recommended corrective measures, including law enforcement, restoration of degraded areas and liquidation of stockpiles. CITES was signed in Washington D.C. on 3 March 1973. The United Nations General Assembly have proclaimed 3 March as World Wildlife Day. ICCWC is the collaborative effort of five inter-governmental organizations working to bring coordinated support to the national wildlife law enforcement agencies and to the sub-regional and regional networks that, on a daily basis, act in defense of natural resources. The ICCWC partners are the Convention on International Trade in Endangered Species of Wild Fauna and Flora (CITES) Secretariat, INTERPOL, the United Nations Office on Drugs and Crime, the World Bank and the World Customs Organization.